A few weeks back I came across news that the Pakistan SEC had shut down ‘at least nine companies dealing in cryptocurrencies and offering Ponzi/MLM, referral marketing, pyramid business/schemes‘. Although this was MLM related news, I didn’t recognize any of the company names and so left it at that. A reader has now informed me that one of the companies the SEC shut down was Dan Andersson’s LEO. The exact legal status of Dan Andersson isn’t clear, but last we heard he was being held in Pakistan. This follows from his arrest mid last year, after which we haven’t heard anything further regarding criminal proceedings. The Securities and Exchange Commission of Pakistan (SECP) has initiated legal proceedings to wind up at least nine companies dealing in cryptocurrencies and offering Ponzi/MLM, referral marketing, pyramid business/schemes. The SECP has advised public not to be misled by any schemes/deals/plans being offered by these companies: Gold Transmit Network Technology (Pvt.) Limited, Green Apple Super Market (Pvt.) Limited, Galaxy Typing Jobs (SMC-Pvt.) Limited, 3-A Alliance (Private) Limited, Pak Memon Impex (Private) Limited, Memon Corporation (Pvt.) Limited, Humanitas Meritus (SMCPrivate) Limited, IDG Enterprises (Private) Limited and Ayat Enterprises (Smc-Private) Limited. These companies were found involved in unlawful activities such as collecting unauthorized deposits from the public, leasing of cars, houses, electronic alliances and other goods and materials. without lawful authority. 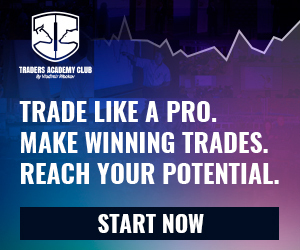 Some of them are dealing in cryptocurrencies and offering Ponzi/Multi Level Marketing (MLM), referral marketing, pyramid schemes, employment schemes in Pakistan. 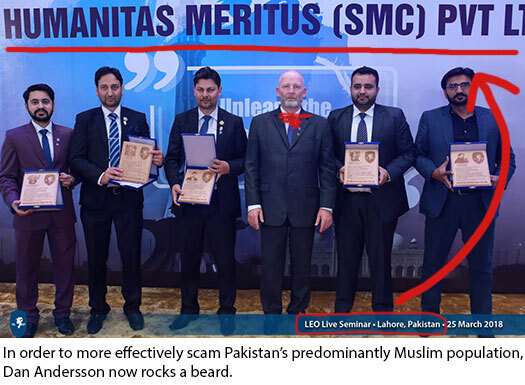 The company Humanitas Meritus (SMCPrivate) Limited is a shell company, via which Andersson ran LEO in Pakistan through. Andersson uses a number of shell companies to run the LEO Ponzi scheme worldwide. The closest to Humanitas Meritus (SMCPrivate) Limited is the Dubai corporation LEO Humanitas General Trading LLC. 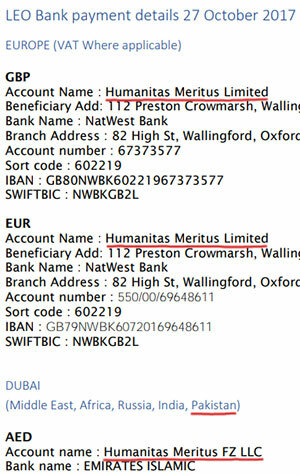 There’s also Humanitas Meritus Limited in the UK. Despite Pakistani authorities cracking down on Andersson and his LEO Ponzi scheme, Alexa still estimates Pakistan makes up 42% of traffic to LEO’s website. South Africa has emerged as a new source of investment, currently providing an estimated 36% of traffic. In the wake of the Pakistani SEC crackdown, LEO has removed any reference to Humanitas Meritus (SMCPrivate) Limited on its website. Contact details for a LEO “sales agency” in Pakistan are still provided, although what business operations remain functional are unclear.